The National Development and Reform Commission, China’s top economic planning body, this week added cryptocurrency mining to a list of about 450 industries that it proposes to eliminate. If the move is finalized, local governments in China would be prohibited from supporting makers of Bitcoin and other digital currencies through subsidies or other benefits. China was once the world’s largest maker of Bitcoin, though rising government pressure has forced many of those who make the cryptocurrency, known as miners, to other countries. Still, a number of Bitcoin miners could remain, especially if local governments ignore the instructions and find a way to prop up local producers, say people in the business. Instead, Mr. Zhao said, some producers may learn to live without subsidies and benefits like discounted electricity. 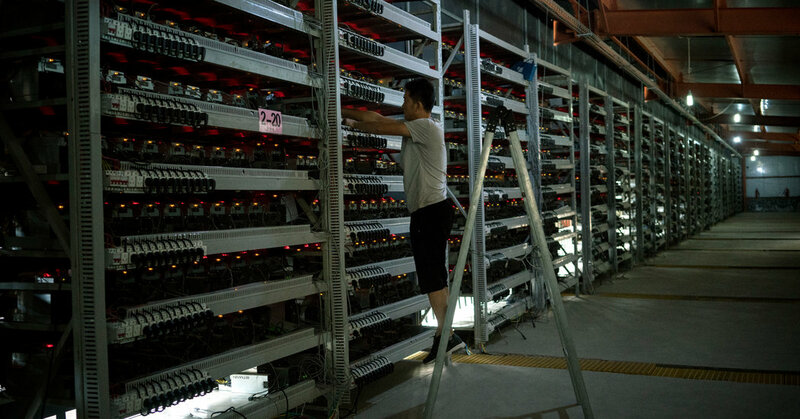 “The change will be the mining cost will rise,” said Mr. Zhao, who still owns a Bitcoin mine in China’s northern region of Inner Mongolia. Bitcoin miners use computers to crunch the mathematical formulas that create the basis for the currency. The business can be quite profitable, especially when Bitcoin prices are soaring, but the process requires considerable amounts of electricity. Prices of the currency move up and down considerably and are currently above $5,000, according to Blockchain, a cryptocurrency firm. China initially embraced Bitcoin and saw local miners as the potential basis for a new industry focused on digital currencies. China also has plenty of power, thanks to its extensively built-out electricity system and the closure of a growing number of heavy industry factories as the economy matures. At one point, China accounted for roughly two-thirds of all Bitcoin produced. The National Development and Reform Commission’s proposal is the first time a central government body has publicly announced a restrictive policy on Bitcoin mining, and it could make it difficult for miners to get loans to expand, said Wu Huiyao, president of the Center for China and Globalization, a research organization in Beijing. “Local governments won’t act against it, so it will be more difficult for them to be approved or receive loans,” Mr. Wu said. Miners said that while the crackdown on cryptocurrency has driven some miners abroad, the total cost of mining is still lower in China, where most of the mining machines are produced.